Posted on February 28, 2009 by Ching under Poker. Cory and April made a special t-shirt for Sunny to wear to the WPT Celebrity Invitational this weekend at the Commerce Casino in Los Angeles, California. On the front of the shirt it has a circular log with all four suits of cards represented and then underneath it reads, Don’t you know who I am? 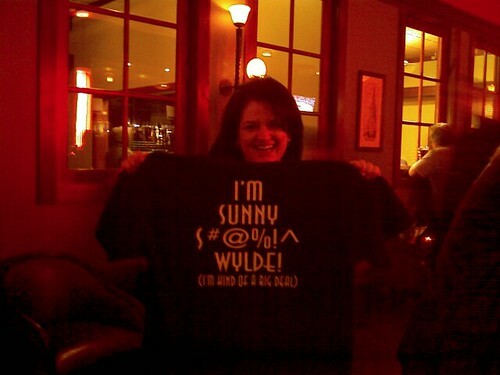 On the back it reads, in big letters: I’M SUNNY S#@%!^ WYLDE! with (I’M KIND OF A BIG DEAL) written under it inside parentheses in smaller print. We’d all talked about making a shirt for Sunny over dinner last Saturday, but Brian and I are used to ordering things online and figured the shirt would never make it in time for their LA trip. Who knew there were places in town that could do that for you in a day? Go Cory for making this happen! Sunny and Scott, Alissa and Shawn, and Kurt and Kathy are all going to on this trip on behalf of WPTAPL. Sunny, Scott, and Shawn are all playing in the WPT Celebrity Invitational poker tournament (because they’re all celebrities in their own right). I believe Sunny with be on TV no matter what because she is being interviewed by Vince van Patten and Mike Sexton. I hope that all three making to the final table, though. It would be fun to watch them all play in a nationally televised poker tournament. P.S. I’m not exactly sure when this episode airs. I believe it will air sometime in March. Please check your local listings. Posted on February 24, 2009 by Ching under Movies. Slumdog Millionaire really cleaned house. I’ve added it to my Netflix queue. What about you guys? Any surprises? Disappointments? Any movies that you really love? Any movies that you want to see? Posted on February 24, 2009 by Ching under Wishlist. We’ve been enduring our old (as in, almost ten years old) washer and dryer for the last few months and they’d started marking our clothes. Well, it was really the dryer that was doing most of the damage but the washer was pretty rusty too. Besides, when you replace one you have to replace the other so that they match. Right? Anyway, we had already spent a fortune on our plumbing this year so we figured that we’d suffered long enough. What the heck! Why not go for it and get a new washer and dryer while we’re at it? If you’re going to go broke, might as well go all out. We drove to our neighborhood Sears (they’re doing 0% financing for 12 months, but I think this is something that they do all the time) to check out the selection. Brian wants a fancy front-load one that is as big as my parents’ set. I think they have the largest capacity available because our six loads at Brian’s parents’ house was equivalent to only three loads at their house. I’m pretty agreeable so whatever. Why not get one with the fancy steam thing like in the TV commercials? Oh, and I love that they make washers and dryers in car colors now. I guess if you’re going to pay the price of a used car for your washer and dryer the least they can do is paint it to match your home decor. Kidding aside, I really liked the red washer and dryer set shown in the top photo. Brian and I both liked it because it had all of the features he wanted, plus all of the unnecessary frivolities I wanted. We almost bought it, except for this little voice in my head that told me we should measure the depth of the laundry closet. We should have done this to begin with, but Brian and I tend to do things backwards (like buying a house and then getting married a year and a half later). It was the re-pipe that created the problem because the water connections were relocated on the right side on the lower part of the wall. They are now behind where the washer and dryer would be instead of above them. We lost a good four inches of depth as a result, which meant that getting a washer/dryer that measures 30″ in depth is out of the question. If we really wanted the fancy, cherry red washer and dryer that we had drooled over at the store just moments ago then we would have to leave the laundry closet open as we wouldn’t be able to close the closet doors shut because of the fronts that would be sticking out. 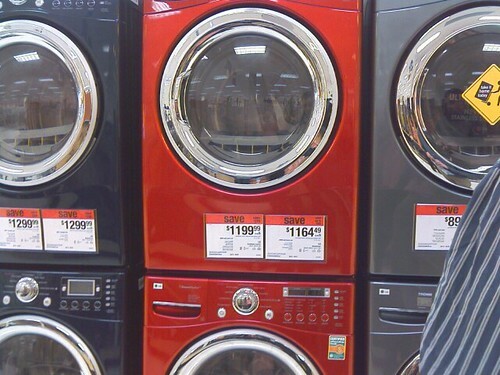 Brian and I looked online to see if there were any front-loading washers and dryers that were 26″ or less in depth. Our old units measured a little over 25″ in depth and the barely fit in the laundry closet after the re-pipe so we figured it would be best to find something of similar depth. We couldn’t find any. 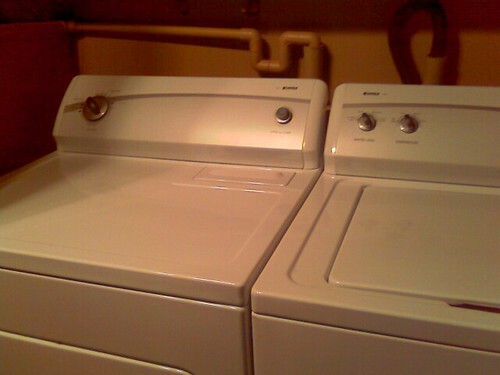 Most front-loading washers and dryers bulge out so even the smaller capacity ones would still be too large. The only washers and dryers we could find that would fit were the old-fashioned ones like the ones we were replacing. On the bright side, the conventional kind are half the price of the fancy, front-loading washers and dryers. “I think this is a sign from God that we should stick to the el cheapo variety and not live beyond our means,” I told Brian. For a lot less than the price of the cherry red washer, we were able to get both a washer and dryer that can fit inside the laundry closet with the closet doors shut. So you don’t always get what you want, but as long as your needs are met then that’s all one can really hope for these days. At least for poor folk like us. P.S. I did get a pair of Brighton studs as a consolation. 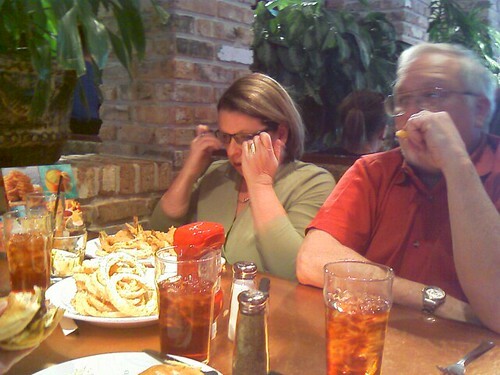 I guess Brian figured that’s the least he could do to keep me from whining. 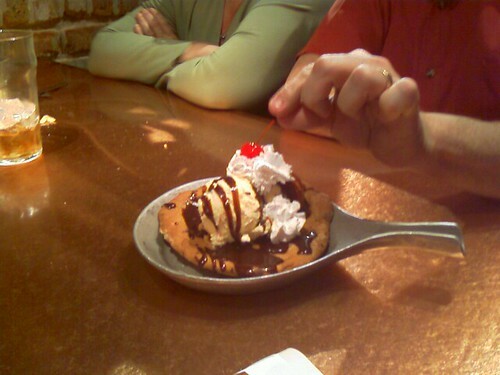 Although, getting me a Cherry Pi necklace would have kept me from blogging about it. It would have been a pretty cheap bribe. Posted on February 22, 2009 by Ching under Family. 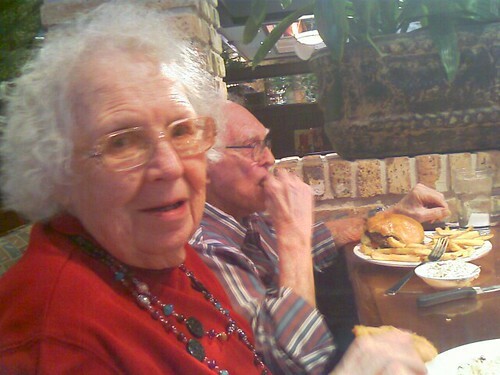 Took grandma and grandpa to Cheddar’s for dinner tonight. 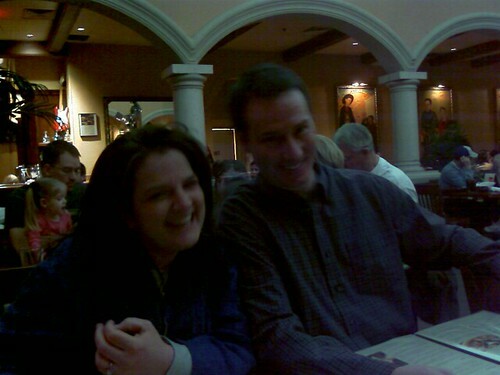 It is our last dinner together before Brian leaves for Germany. Posted on February 22, 2009 by Ching under Life, Poker. Sunny was actually a good sport and helped me polish off two one-liter carafes of sangria. 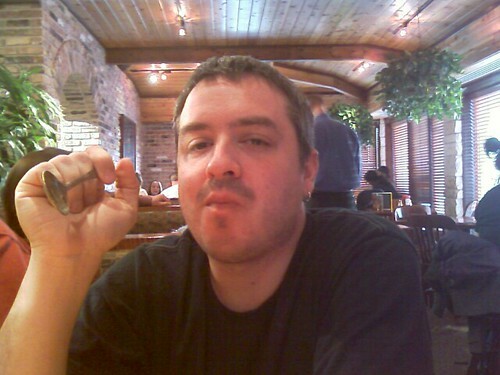 The sangria at Abuelo’s is pretty good, but not nearly as good as my own sangria… Or so Sunny says anyway. In attendance last night: Sunny and Tallboy, April and Cory, Becca and Jay and Mama Dill, and Brian and me. Dinner was fun and we finished in time for the Blue Collar poker tournament. Brian and I did not do well at all and were both knocked out before the break (again). Becca won the whole thing, though. Go, Becca!